As we get older our facial muscles naturally start to lose tone and elasticity, which can be because of a number of different factors such as ageing, weight loss, genetics and environment. This sagging of the skin and loss of tone can make us look tired, sad and older than our true age. At JR Beauty Aesthetics clinic our highly trained team are fully trained in the use of the CACI non-surgical facelift machine. This award-winning CACI treatment sends small electrical impulses and signals that stimulate muscle tone and enhance skin tissue with micro current technology. CACI treatments lift the face by toning muscles and smoothing fine lines and wrinkles and help to prevent sagging skin. 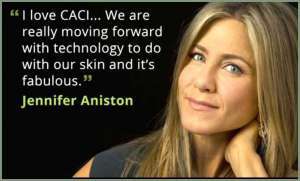 CACI has attracted a unique celebrity following, making it the most publicised beauty treatment in the industry’s history. CACI clients include famous faces from the world of show business, music, media and royalty. What ever your concerns jowls, eyes or neck the CACI Ultimate can be adapted to all different types of treatments, Book your free consultation now with a member of the JR Beauty Aesthetics team. It is an advanced non-invasive facial with over 20 years medical research behind it. The treatment can deliver visible results without the need for surgery. Tiny electrical impulses will lift and tone the facial muscles while improving skin elasticity and reducing the appearance of fine lines and wrinkles. A course of 12-15 is recommended 2-3 times a week. Ask your skin therapist for further details and book your course today. The CACI jowl life has been developed to specifically target muscle laxity around the jaw line using quad probes specifically designed to lift and firm the muscles and refine facial contours. This skin resurfacing treatment works by gently removing the superficial layer of the skin to help skin blemishes, scarring, sun damage, fine lines and wrinkles and stretch marks. LED light therapy is also used to target your concerns. The hydro gel mask is applied to hydrate and calm leaving your skin brighter, clearer and revitalised. Hydro-tone uses an intensive anti-ageing hydro-mask that will instantly rehydrate, revitalise and plump the skin. Hydro-tone combines active micro-current rollers which restore muscle tone, firmness and propel the ingredients deep into the skin. It has an immediate cooling effect which will soothe and calm and skin redness and irritation. Great for a special occasion, gives a fantastic result after just one treatment and is perfect for brides to be. This 30-minute treatment is a must-have for anyone concerned with ageing and puffiness around the eye area. It soothes tired puffy eyes, combines dark circles, reduces fine lines and wrinkles and lifts hooded eyes. The treatment uses serum filled CACI micro-current eye rollers along with nourishing hydro eye mask to help soothe and calm skin. The ultimate anti-ageing treatment is an advanced facial which focuses on all your anti-ageing concerns. The ultimate procedure incorporates muscle lifting and toning, microdermabrasion LED light therapy, plumping of fine line and wrinkles and hydrating eye mask to rejuvenate and brighten skin.